GET TO KNOW YOUR FELLOW PLAYERS! DEMETER MANNING was a born-and-raised New York City girl. A Brooklyn Dodgers booing at the Yankees kind of girl. A growing up in an apartment, playing in the street, riding the subway to a specialized science high school in the Bronx kind of girl. “Every now and then my mother would let me skip school on a Wednesday to go to a matinee,” kind of girl. And then, suddenly, “It was the 60s, I didn’t know what I wanted to be when I grew up. I was a party animal,” she admits. A reveler extraordinaire, she actually transformed one of her bedrooms into a scary, totally darkened, third-dimensional Halloween maze and kept it that way for YEARS. Via Syracuse University and Brooklyn College, Demeter followed her beloved Dodgers to California and to the University of California at Santa Barbara, where she studied psychology and became, of course, an I-don’t-know-anything-about-it computer programmer. The panic didn’t last long. She was soon in LA working on mainframes, graduating into systems management, and then administering her own group. Introduced to bridge in the 70s through a Mensa interest group, Demeter hosted a series of bridge dinner parties in the mid 80s and unknowingly met the man who would eventually become her husband. Years later when they were both free, they began playing in tournaments together and then never parted. “Tom” developed the core of “Bluejay,” the system Demeter now follows with several of the people who play with her. (Alert, alert, alert, alert!) Her husband approved of her love affair with the 1950 Mercedes-Benz S-Class, the first of the company’s full-sized luxury flagship vehicles. She owned a snazzy one, complete with little arms that popped up for turn signals. Demeter also spent years as a motorcycle junky, mostly riding and camping by herself. She stopped at 60 when she underwent a series of surgeries and lost “chunks” of her body to cancer. She retired twice from work and then ran a real estate business. Who knew? They set a very high standard for good sportsmanship and partnership compatibility, the mother/daughter team of PAT and ANN GARLAND. While they don’t always agree at the bridge table, their loving, close relationship makes them “feel free to criticize each other,” according to Pat. The two began duplicate lessons with Brad Kalweit in September 2003, and Ann joined the ACBL one year before Pat. They currently play each Saturday morning at the Olympia Bridge Club, and Ann plays at the Old Town Center in Tumwater on Thursday and the VFW in Olympia on Wednesday. Ann grew up as a middle child and says her mom “wouldn’t take sass” and that you could “count the ways” she was ganged up on by her two brothers. She graduated from Canyon High School in southern California in 1977 and went on to attend two junior colleges and work for two different companies in child care. She developed an interest in library science and is an avid reader. Ann is also self taught in genealogy and has traced her roots back to the American Revolution—a fifth great-grandfather served in the Revolutionary War and a fourth in the War of 1812. Mom Pat was born in Arkansas but at age five moved to southern California. Married at the tender age of 15, she later obtained her G.E.D. at age 22 so she could go to college. After receiving a scholarship from the American Medical Association, she studied nursing and completed her A.A. degree at Fullerton State University in 1969. She graduated on a Friday night and began work the following Monday at Children’s Hospital Orange County, where she retired 31 years later. Being “sick of traffic, weather and expense,” she moved the family to Olympia in September of 2001. Sadly, Pat’s older son Gary passed away on February 15, 2019, from terminal cancer. 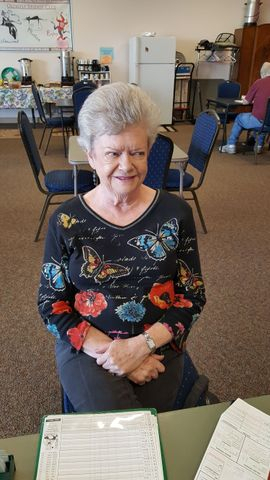 When John Penney first telephoned Helen Miller after meeting her at the bridge table a few years ago, he told her he would like to get to know her better. “I was surprised, and I almost hung up on him,” Helen confesses. “I wasn’t expecting a relationship and had kind of succumbed to being single.” Happily, she didn't spurn him. Married now for a year and a half, the couple has moved into a new home together (with just 30 boxes of necessities left to unpack) and also has a new addition to the family – a bridge club! John and Helen acquired the Olympia club from Brad Kalweit at the beginning of the year. “We love the game and enjoy the people,” John explains. They’re both still working full time, but they eventually hope to market the club and reach out to new players through lessons. John pronounces the letter “O” like one would expect of a proper Nova Scotian. He studied at Dalhousie University in Halifax and is a computer guy (“from the card punch days to the Internet”) who has worked “in a whole wack of places” in both Canada and the states while pursuing “the challenge of new technology.” He’s currently employed remotely as a Quality Assurance Analyst for a company in Detroit. Helen, meanwhile, describes herself as “a career state worker” who first came to Washington from Idaho after receiving a full-ride scholarship to Saint Martin’s University in Lacey. She currently wears “multiple hats” as a software developer and database and Share Point administrator at the Office of the Attorney General. “The challenge of figuring things out,” is what Helen says she enjoys most about her career. “I learn something most every day,” she adds. Both motorcycle junkies (John is on his eighth bike, Helen her second), Helen has also ridden her bicycle in the Seattle to Portland race many times. She used to be an adventure racer, enjoying mountain biking, kayaking, trail running, and orienteering. She loved participating in races in unfamiliar terrain in which she and her teammates received latitude and longitude points, plotted them on a map, and with only a map and a compass had to figure out a course to those points. After her first 100-mile race in Cle Ellum, “I got addicted,” Helen says. John, meanwhile, is a 20th century history buff with a family background in the Canadian and Newfoundland military. His relatives fought in World War I, World War II, and the Korean War. He’s currently reading London 1945 - in the Debris of War. John’s three sons and a grandson live in Canada. Helen’s two brothers and a sister have given her 10 nieces and nephews and five great-nieces and great-nephews. John’s psychological profile is that of a “high revealer,” and he discloses that he was once the treasurer of the Wolfville, Nova Scotia, bridge board. He learned the game at 7, but Helen didn’t come on board until 2007 when a co-worker invited her to play and she then took lessons from Brad. “I grew up playing pinochle with my family,” she admits. “Now pinochle is boring!” Sure, Helen and John met at the bridge table, but is theirs just another bridge romance? Nah. They describe it as a lifetime partnership. It took BILL CURTIS almost 30 years of playing bridge under the old Goren system before he found lessons with Brad Kalweit and realized he “knew very little about the game.” Bill originally learned from a friend at Indiana University who still travels with him. Bill notes that the Goren basics are good but frustrating - 14 points are required to open, and the system teaches very few conventions. Thanks largely to Brad, Bill is only 13 points away from obtaining his ACBL Life Master rating. Ironically, Bill almost became Brad’s Latin teacher years ago at Fairview High School in Boulder, Colorado. Although born in Bremerton, Bill grew up in Tumwater. Serving as student body president, he graduated from Tumwater High School in its first year of existence, 1962. Early honors in 1957 included earning an Eagle Scout Badge and becoming the state free-throw champion. After receiving a bachelor’s degree in Latin at the University of Washington, Bill went on to graduate from Indiana University with an M.A.T. in Latin in 1968. Then followed a long history of teaching Latin (41 years), coaching basketball and baseball (26 years), and coaching Knowledge Bowl (19 years) and Academic Decathlon teams (13 years) at Capital and Olympia high schools. In addition, Bill served 14 years as the chairman of the Washington State Latin Teachers Association. Why Latin in the first place? “I liked ancient history, mythology, and word derivations from Latin roots,” he explains. Quiz time! Which one of the following is NOT true about RANDEE GIBBONS: (1) She used to be a massage therapist in California. (2) She spent several months reading (and finishing) War and Peace. (3) She composed a raga and took classical North Indian singing lessons. Hmm...Was she really into massage? Yup. Surely she didn’t read all of Tolstoy’s classic??? Absolutely, and she savored it! Heck, she read all of Anna Karenina, too! Gosh, that leaves the “raga” as the odd one out. Fooled you! She studied Indian spiritual music for two years and wrote her raga while in grad school. If you don’t know Randee, you’re in for a treat when you meet her. She says she has been “blessed” and “lucky” all her life. It’s TRUE that she’s a world traveler if you count Croatia, Denmark, Greece, Italy, Sicily, Morocco, Egypt, the Czech Republic, England, Wales, Scotland, France, Slovenia, Bosnia, Sweden, and Portugal as global destinations. Randee has trekked across the US a bit, too. Originally a California girl, she earned a bachelor’s degree in political science at Colorado College. She has a master’s degree in public policy from Berkeley and another master’s in art and consciousness from JFK University. She ended up in Vermont for five years, experienced northeast winter weather shock, and “learned the meaning of gratitude for a cup of hot chocolate.” Eventually Randee, her sister Kathi, her brother-in-law Rex, and her mom clustered in Washington, where her niece Nikki also lives. Randee now works for the Washington State Employee Assistance Program (EAP) as a customer experience manager. The “guts” of her job, she says, is talking to human resource leaders to find out what the EAP can do to better help employees resolve personal or work-related problems. Randee, now 57, also spent 10 years at The Evergreen State College, serving in its public administration program. Through these jobs and others spent helping others, Randee has developed her own love of learning, which she says is “dear” to her heart. “If I won the lottery, I would read and take classes until I died!” she laughs. While stationed in Okinawa, Air Force fighter/bomber technician and upstate New Yorker DAVID HOPKINS first learned to play bridge, along with three other servicemen, from a beginner’s book. After leaving the military in 1963, David spent two years at the University of Maryland, followed by two more at Eastern New Mexico University, earning a B.S. in industrial psychology. 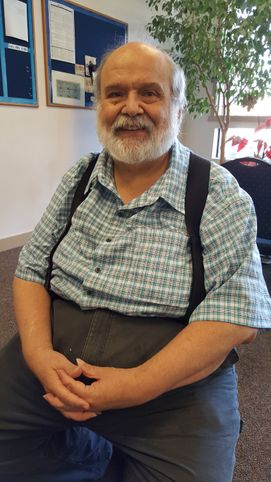 After completing a master’s degree in social work at Virginia Commonwealth University, he was hired by the Veterans' Hospital in Lakewood, Washington, where he retired as a GS-13 after 30 years of service. His last position was as the director of a 60-bed treatment program for homeless veterans. David has two grown daughters: Lori, living in Olympia, and Jeanne, in Lakewood. He is a service-oriented, diverse kind of guy. 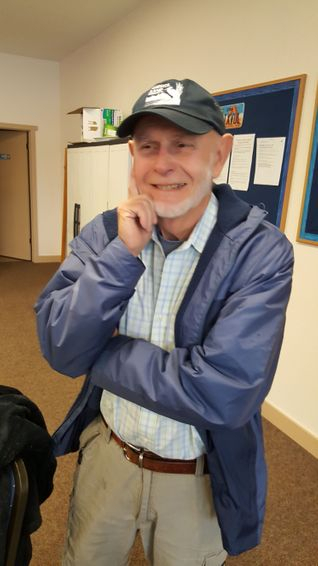 After moving to Shelton in 2004 with his wife Kathleen, he resumed playing duplicate at the “fun” Alderbrook Bridge Club, where he was "encouraged” to take the director’s helm in 2015. He became a life master in 2016. David also served on the Unit 441 ACBL Board for 8+ years. He is a past president of Kiwanis and of the Steilacoom Museum Association. Picture FRITZ WOLFF three miles underground at the largest silver mine in the U.S. Now think of him as the self-deprecating author of A Room for the Summer: Adventure, Misadventure, and Seduction in the Mines of the Coeur D’Alene. And you thought Fritz just played bridge on Wednesday nights! 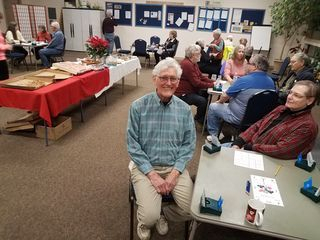 Not everyone can have a “blast” as a mining engineer and metallurgy expert, but Fritz “never looked back” after he spent three college summers in the late 1950s apprenticing at The Bunker Hill Company in Kellogg, Idaho. He had so much fun that he went on to write his well-received book, published in 2005. “I wanted to describe not only the day-to-day business of drilling and blasting but also the guys I worked with,” the ones who lived up to their promise, “We’ll keep you alive, young fella.” Fritz still travels to Idaho once a year for a “salubrious” dinner with those hard-rocking mining pals. He’s 81, but he’s not the oldest of the bunch. Fritz enjoyed a second career with Boeing in aerospace management. “That was fun, too,” he recalls. “I essentially worked at jobs doing exactly what I wanted to do.” Retirement? More joy for Fritz, who became the principal investigator with the Washington State Geological Survey, collecting data on inactive and abandoned mines. She’s knocking on the door of Platinum Life Master, only about 100 master points shy of the title. Then PHYLLIS RAKEVICH, arguably Unit 441’s top female player, will lack only a national title to be an ACBL Grand Life Master! Interesting that Phyllis, even after her 35-plus years of experience, shares that she is still “always learning” the game. Phyllis finds that defense, in general, is the most difficult aspect of duplicate because it mandates good communication with one’s partner. She is largely self-taught and began playing around 1982 with her late husband Bob and another couple at the bridge club in Aberdeen. She arrived at the Olympia club in 1989. She introduced bidding boxes, computer scoring, and modified Bergen. Favorite authors of hers include Max Hardy, Marty Bergen, and Jerry Helms. Born in Edmonton, Alberta, Canada, Phyllis became a U.S. citizen when she turned 21. She was a stay-at-home mom with her two children, Barbara and John. Now grown, they are non-bridgers, both living in the Olympia area. Phyllis enjoys cooking “semi-gourmet” meals for them, usually once a week. She has traveled the world conducting bridge classes on ships. Other Phyllis hobbies include crocheting, knitting, and reading. Several years ago she also taught herself to tat, a very intricate form of handwork. JIM REMY, he of the booming voice, he of the buoyant style, he of the ready story and smile, dances his way through the best of his times. Literally. On a “Dancing with the Stars” Alaskan cruise a few years ago, he found himself drawn into the ballroom music and the rhythm and then the fox trot, swing, soft shoe, peabody, quick step, samba...swaying, twirling, and whirling. At 81, and “still running on the original equipment,” Jim now competes in the senior games. He and his partner also dance in charity and holiday events and give dazzling demonstrations, often accompanied by Frank Sinatra. That original dancing cruise also waltzed Jim into traveling. Russia, anyone? Hungary, Austria, Germany, the Netherlands, France, Finland, Estonia, Canada, the Caribbean? Just a few of the far-away lands that have drawn him. And can he ski to his destinations? With “SKIBUM” on his license place, it’s a good bet. He powders all around the West. Jim will be in the thick of his ski club friends when they meet for a December kick-off in British Columbia. After moving around quite a bit while growing up, BRENDA HATCHER and her sister learned basic bridge through the YMCA in Pittsburgh, Pennsylvania. She continued to play on and off with her parents, especially party bridge with her mother, who was a bridge teacher later in life. Brenda’s family moved to Vancouver, Washington, following another Alcoa transfer for her father, and Brenda graduated from Western Washington University in Bellingham. She had played some computer bridge, but in 2012 she made a New Year’s resolution to find “real” people to play bridge with. Then she found a bridge flyer on her car offering lessons at the Olympia Bridge Club. In 2014 Brenda won the Unit 441 award for the most points won by a player in the 0-99 category at the Pow Wow sectional. Brenda has master’s degrees in both sociology and education, and she taught elementary school for three years at a private facility in Snoqualmie. She gave swimming lessons for five years while also volunteering part time for SideWalk, a homeless advocacy center in Olympia. In 2015 Brenda was offered a position as operations manager at SideWalk, and she continues to manage volunteers there two days a week. Brenda and her husband Steve are just celebrating their 40th anniversary. Steve also attended Brad Kalweit’s bridge classes for a short time, but he didn’t connect with the game, saying it’s “too slow.” Brenda and Steve have one son living in Redmond and another far away in Brooklyn, New York. He’s tall and she’s not, but they nevertheless look the same. Maybe it’s the matching outfits they wear. 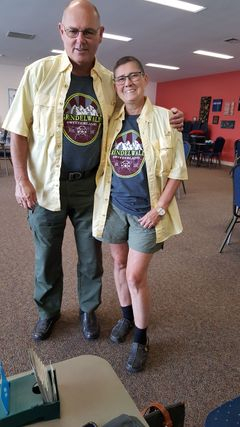 “We started dressing alike because I used to lose him all the time when we went shopping or traveling,” PAT ROBBINS laughs. The first date she and husband ORRIN had was a “blind” one, apparently successful because their marriage is 44 years old and counting. Not surprisingly, their email address includes a cozy “robbinsnest.” Bridge joined their world when they took lessons on a cruise to Antarctica. Something clicked, and the Robbinses looked up Brad’s club when they returned. Along the way they both earned undergraduate and graduate degrees. Orrin was an army infantry officer “for 20 years and four days.” They were stationed in Georgia, Panama, Texas, Kansas, and Washington. (He was also a stockbroker for 24 years.) Pat began her career as a nurse and later worked for government contractors BDM and Cubic. She ran a world-wide security program and dealt with all branches of the military. The couple also raised a son and a daughter and now dote on three grandchildren in Alabama and one in Washington. After graduating from UW with a double degree in math and physics, Stan worked at a National Oceanic and Atmospheric Administration’s Marine Mammal Lab in Seattle before being hired by Boeing in 1979 as a typical “cocky young computer programmer.” His mantra was “I can do anything, given enough time and money!” Stan, who worked for Boeing for 34 years before retiring, advises that Boeing "turns employees into old curmudgeons." Not necessarily a bad thing, he further notes. Dave has traveled a long way from his Navy days in the Mediterranean when the Arabs and Israelis decided to go to war and then in Greece when the government there finally collapsed. After serving as an aviation electronics technician in a helicopter squadron, Dave returned to Illinois to complete his college education and embark on a 35-year career as a community college instructor in Joliet and Centralia, teaching electronics, computer science, and robotics. He doesn’t mention it, but a friend points out that Dave placed the majority of his students in real-world jobs. He credits a partnership with Intel for the success of his Centralia College graduates. VALERIE and JERRY McVAY were interviewed together because both insisted they could tell their story/stories better. This marital battle union has lasted 49 years! Valerie, born in 1939, was raised for 10 years outside London during WWII at a time when the air raids were all too real. In 1949 she moved to Vancouver, Canada. Sometime in 1968, to celebrate her second divorce, she attended a Seattle regional bridge tourney wearing a mini-skirt. She was noticed by Jerry, “a leg man,” who asked his Canadian friends about her. They all warned, “Stay away! She’s trouble!” Jerry didn’t listen, paid the price, and the two were married in 1969. Valerie subsequently “slid downhill” to the U.S. and worked in Silicon Valley as an accounts payable supervisor for most of her career. Jerry was raised in Walla Walla, Washington, and worked in pea and wheat harvesting during his summers there. He attended Whitman College for two years and then earned an M.S. in music at Washington State University in Pullman. He spent approximately 28 years with a family-owned food distributor in the San Francisco Bay Area, where he and Valerie lived for some 38 years. The pair loved their jobs and their bosses. Jerry recalls happy times riding a tandem bike with Valerie, often taking 15 to 35-mile trips. 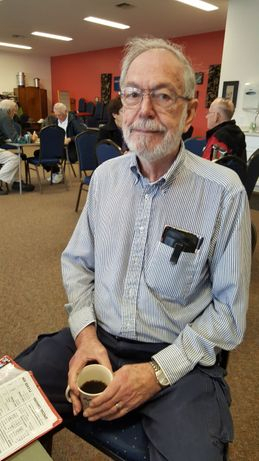 Jerry started playing duplicate bridge in 1958, and became a life master in 1962. After being born in the small village of De Meern in the Netherlands and becoming a registered nurse, JEANINE GRAHAM followed up on a friend’s invitation and emigrated to Kalamazoo, Michigan, later settling in California and finally in Washington. Her career spanned surgical, newborn, and geriatric nursing, and she also worked as the administrator of an Alzheimer’s facility. Jeanine struggled to learn English when she first moved to the United States and had difficulty understanding the culture. She's more at "home" now. Her busy years of nursing ending with her retirement in 2007, Jeanine says she found herself “with not much of a social life” until she noticed a flyer in the newspaper offering free bridge lessons. “The rest is history!” she jokes. Jeanine also discovered quilting after a visit to the Henderson House Museum in Tumwater and has since displayed as many as 14 quilts at various shows. “I’m always starting a new one and still have four or five unfinished ones,” she says. “I love to put fabrics together so they are harmonious color-wise.” A sample of her handiwork, shown in the picture, hangs in the bridge clubhouse. An interest in oil painting, Chinese brush painting, watercolors, and beading add to Jeanine’s creativity. 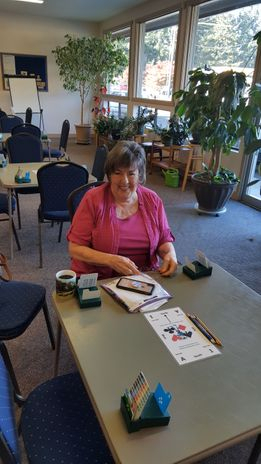 KATHI MCKAY owes the beginning of her friendship with bridge to her mother and a hand-held device called “AutoBridge.” She learned the rudiments of Goren in elementary school and started playing with her mom’s party bridge group. Years later someone tactfully suggested that she contact Brad Kalweit for lessons. Kathi currently plays most Monday and Wednesday evenings and in the once-a-month unit games. Kathi grew up in Olympia but left the city for 32 years. She enjoyed a career in international development (foreign aid), living in Papua New Guinea, the Philippines, and Washington, D.C. She bought round-the-world tickets several times, stopping to visit other foreign lands during her travels to and from her assignments. Kathi returned to Olympia 15 years ago on a sabbatical leave and decided to stay. Retired engineer JIM LOOMIS looked for life on Mars, detoured into a law practice, and once played bridge eight hours a day for eight straight days while crossing the Atlantic on a troop ship. Who knew? After graduating from Iowa State, Jim worked for Lockheed Martin as a mechanical designer in the aerospace industry, spending time in Sunnyvale and Denver with a short stint in New Orleans. He helped design “The Viking,” the first successful Martian lander. He added a law degree from the University of Denver to his resume and tried a solo practice, unfortunately at a time when lawyers were more than plentiful. “I was really tired of the kind of work I had to do to remain solvent (i.e. divorces),” Jim reports, so he transferred back to his engineering career. He and his wife of 59 years have a son who is an electrical engineer and a daughter who is a social worker. Bridge? Oh yeah, Jim still plays that, too. He used to kibitz in the dorm when he was in college. One day a player had to leave to go to class. The remaining partner pointed at Jim and said, “Sit down and deal.” He did. Then came the tour of duty on the troop ship, which was carrying Army Corps of Engineers personnel to southern France during the time when the Germans were building the Berlin Wall. “Does anybody play bridge?” came the call the first day on board. 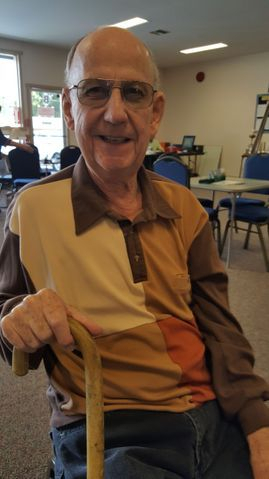 Jim has been an avid player for a good portion of his 80 years. ED MACKE’s career actually led him to the bridge table. A graduate of Seattle University and the University of Washington medical school, Ed practiced family medicine in McCleary for 37 years. One of his long-time patients was Phyllis Rakevich, a talented bridge player, who told him all about the game. Phyllis’s daughter and son-in-law, who were friends of his, convinced him to give it a try. Now he’s dedicated to attacking on defense, paying attention to leads and discards, and tackling the other challenges of bridge. A 70-year-old, Ed and his wife (who died in 2014) are the parents of son Cole, who is starting medical school this summer, and son Jeff, who teaches high school in Camus. His family also includes a granddog, two inside cats, and three outside cats. Ed has enjoyed time spent in Switzerland, Italy, and Mexico, and likes to garden and grow plants on his deck. One of the most rewarding parts of being a doctor, Ed says, is that so many of his patients also became his good friends. Free now from the frustration of dealing with insurance companies and government regulations, he enjoys the new friends he’s making through bridge. SANDI STEGMAN is a Seattle gal, born and raised there. Sandi was introduced to the game of bridge in 1971 by Craig Shanafelt's parents (Sandi was married to Craig's brother at the time). The following year, Sandi discovered she was "hooked for sure" on bridge when she played duplicate for the first time at a Seattle regional. Despite bidding an erroneous weak 2-clubs opener, she and her partner placed very admirably, finishing 1st in their section and 2nd overall. She also found out she loved competition and earned her ACBL life master rating at the age of 25. At 35, she took a 20-year vacation from bridge and became an accomplished poker player. After moving to Olympia in 1977, Sandi became one of the first three women U.S. Postal Service letter carriers in the Olympia/Lacey/Tumwater area. She retired after 30 years of federal service in 2005. In 2007 she became a table games dealer at the Red Wind Casino, where she worked for eight years before retiring for good!! Remarried at 51, Sandi is still with second husband Steve, who is not a bridge player. She is blessed with a very close family: sons George and Michael Shanafelt; grandchildren Jerred 16, Lena 15, and Kento and Kaito, 13 (twins); two brothers living in Seattle; two sisters-in-law, and six brothers-in-law.